Hi my lovely cake friends!! Recently I was asked by a member of the Maryland chapter of Friends of the NRA to provide a cake for one of their local events. 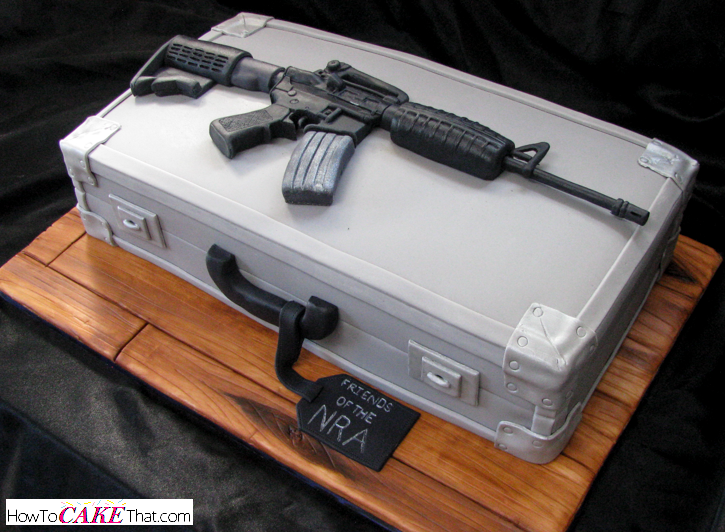 The cake that was requested was a duplicate of one I had made for my uncle's birthday a couple of months ago - a black fondant AR-15 rifle on a gray gun case. 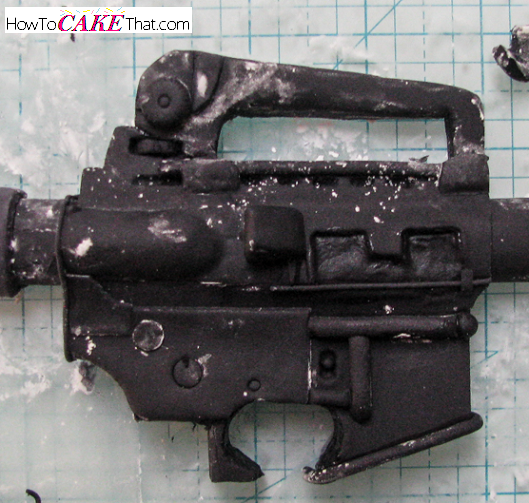 And when I had posted that cake, so many of you who follow me on my business page asked me how I sculpted the rifle. 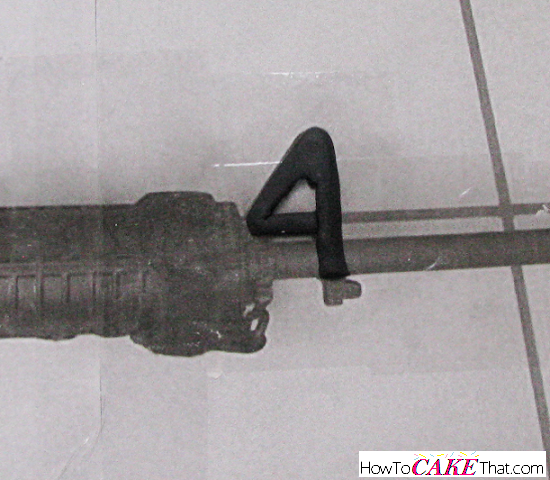 So, this time I made sure I took plenty of photos to give you a good idea of how the realistic fondant AR-15 rifle came together! Note - this rifle cannot be sculpted all at once! Plan ahead and allow a few days for sculpting and drying. Also, this rifle took me about 7 1/2 hours to complete. 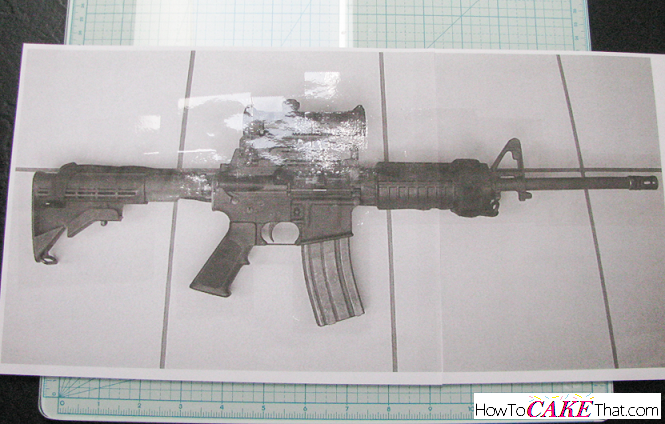 To begin, I printed out a photo of an AR-15 in the actual size I needed for my cake - this will be the template I model my rifle after. 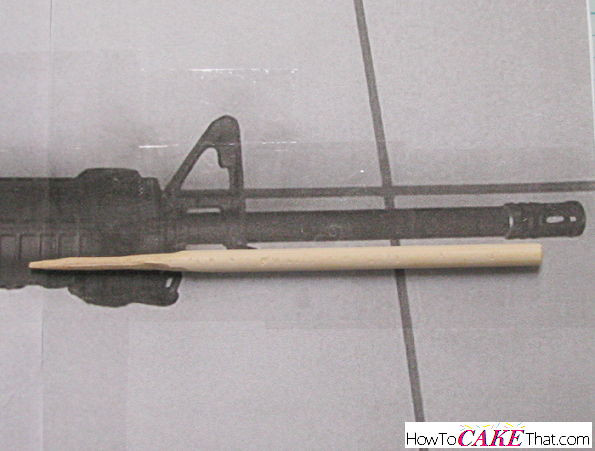 My gun case cake was about 16 inches long, so my gun needed to be about 15 to 15 1/2 inches in length. Next, I placed clear masking tape over the printed image to protect it. To use the same image I used, click here. 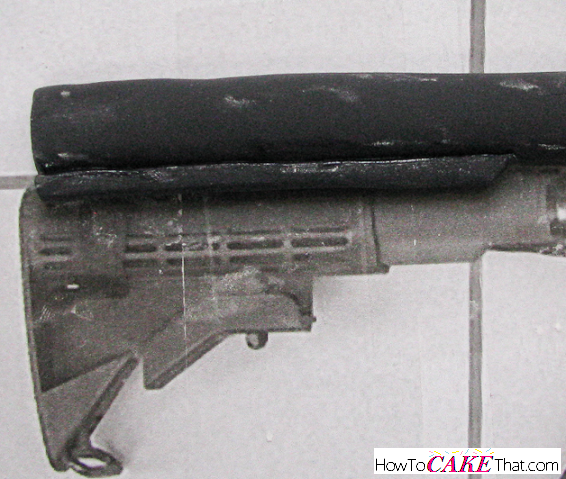 Using black fondant, I rolled a large fondant "snake" about the same width as the long barrel that runs the length of the thick part of the rifle. This barrel piece will be the support and backbone of the entire sculpture. We will build up and around this piece for the remainder of the tutorial. Note: I am just using a fondant and gum paste blend - about 3 parts fondant to 1 part gum paste. Use a very sharp knife or a razor blade for a nice clean cut. Trim the fondant barrel just at the end of the thick round piece (the hand guard), but just before the sight. For a diagram to understand the names of the different parts of the rifle, click here. I highly recommend having this page open as you read through this tutorial. The profile barrel is long and skinny and needs extra support. For the added support, I used a wooden dowel. Trim the dowel slightly longer (mine is about an inch and a half or so) than the profile barrel. 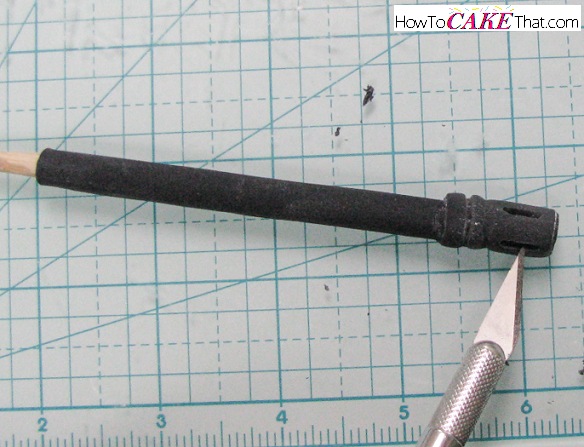 Use a sharp knife to whittle down the excess length of the rod to a thin point. This thin point will be inserted into the thick hand guard and the rod will hold the profile barrel up and off of the surface of your cake - giving it a realistic 3D appearance. 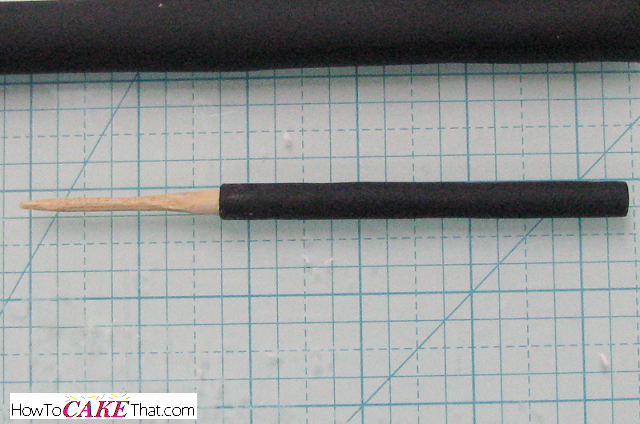 Next, I rolled out a very thin piece of black fondant and trimmed it to an appropriate size to cover the part of the dowel rod that will be exposed. 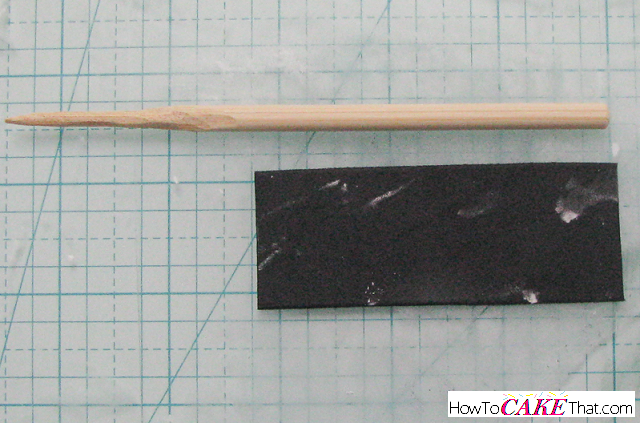 Leave the whittled part of the dowel uncovered. Dip the end of the dowel rod that will be covered in fondant in water. 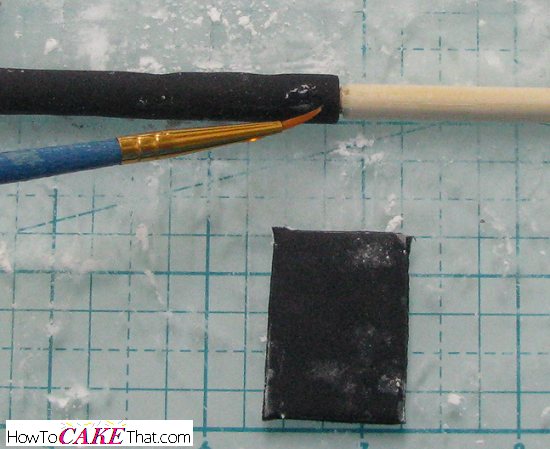 Lightly wipe off the excess water and wrap the end of the rod in the black strip of fondant. Let the profile barrel rest and dry - be sure to place it seam side down. Next, I shaped the sight and the trigger. Be sure to insert a small piece of wire into the top of the trigger to allow for it to be supported and easily placed into the rifle. Also, add a small piece of wire to the end of the sight that touches the handguard. Allow all of these fondant pieces to dry overnight (or longer) before moving on. 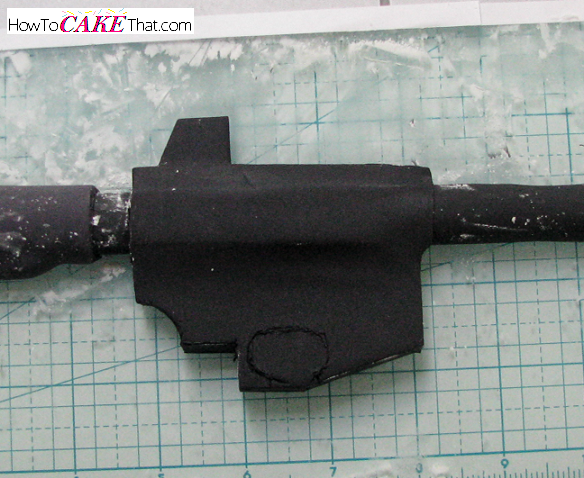 Once the fondant has dried overnight, it's time to give the large barrel of the gun a little extra support. To add support, I inserted a straight thick gauge piece of florist wire into the barrel. The piece of wire was only about 1/2 the length of the barrel. Inserting the wire into the barrel is not easy and must be done very carefully or the wire may poke out of the sides of the barrel. On the back end of the gun, notice there is a "lip" that sticks out on the underside of the rifle. 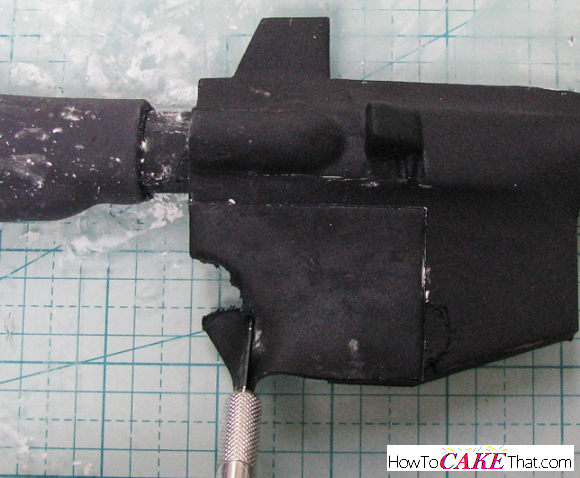 Imitate that lip shaping a piece of fondant and adhering it to the bottom of the gun barrel. Glue it to the barrel by lightly brushing it with a little water. Next, roll out a thin sheet of dark gray fondant and trim it to the same width as the layer of metal (lighter color in the photo) that lays completely over that "lip". Brush the area that will be covered with this piece of fondant with a little water and drape the fondant over it. Shape the fondant around the barrel and trim off excess. Now it's time to add the back part of the gun that has the holes in it (6 position telestock). 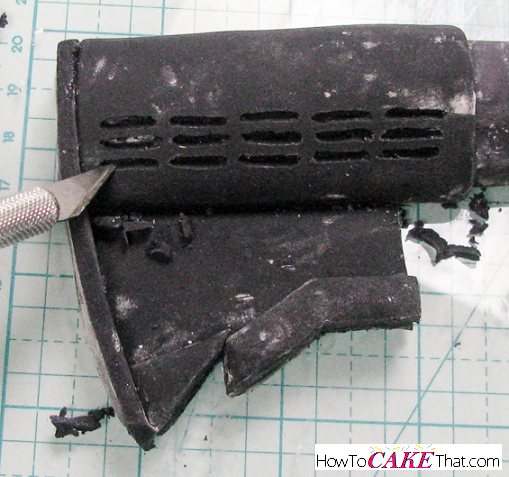 Roll out a thin piece of black fondant and trim it to the width of the telestock. 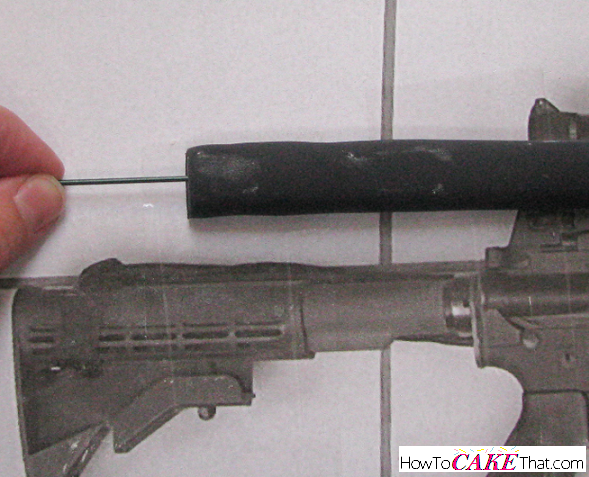 Next, dust the barrel of the gun with cornstarch to keep the next layer of fondant from sticking to it. 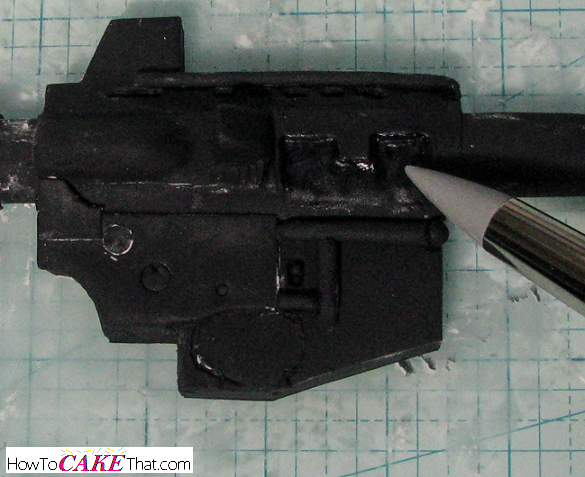 Brush only the top and bottom area with a little water to help the black sheet of fondant stick to the gun barrel. The cornstarch will help later on when the holes will be cut and it will keep the pieces that need to be removed from sticking to the barrel. 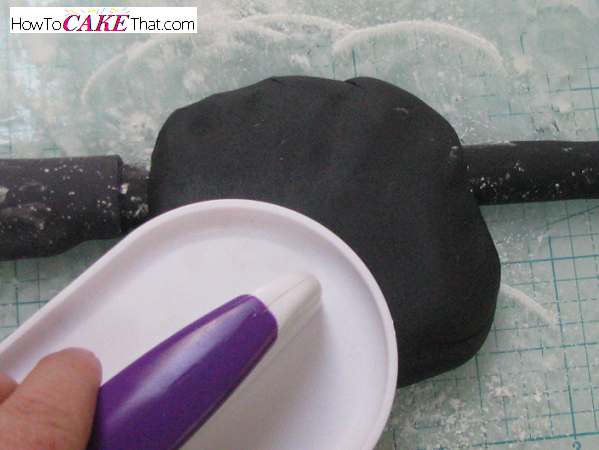 Shape the piece of fondant around the barrel and trim off excess. Now back to the small profile barrel. It's time to add the flash hider - the small end piece of the profile barrel that has holes in it. 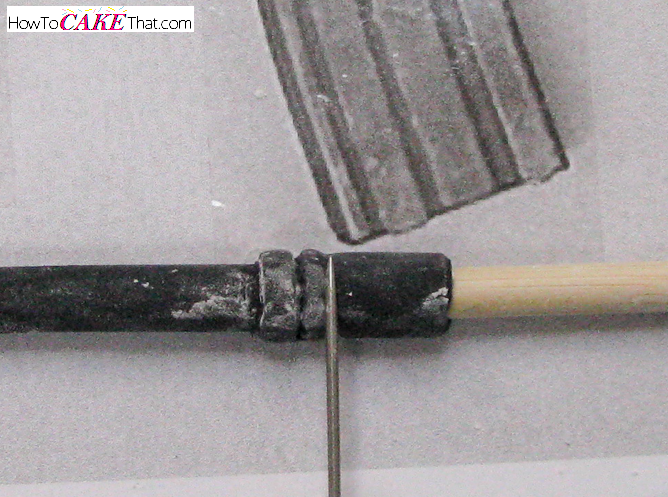 To give it a 3D hollow effect, line a dowel rod up with the end of the fondant covered dowel rod. 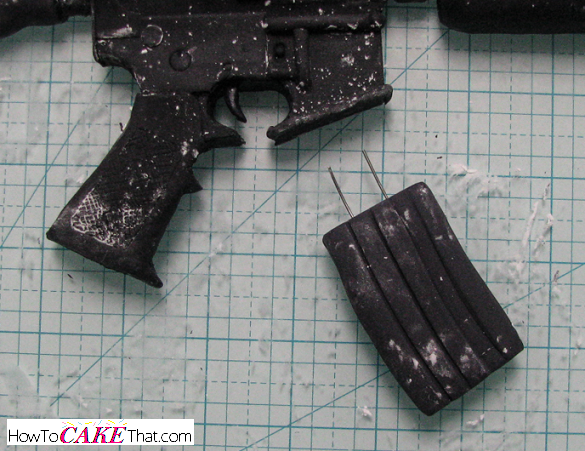 Roll out a thin piece of fondant and trim it to the same width as the flash hider on the template. 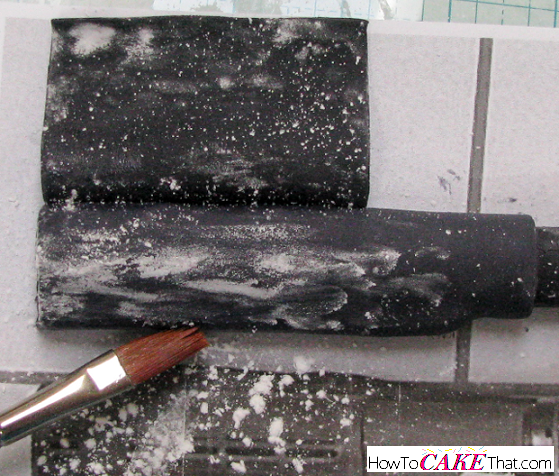 Lightly brush the very end of the fondant covered profile barrel with water. Wrap the thin piece of fondant around the end of the profile barrel, ensuring a good amount of the fondant is draped over the dowel rod. 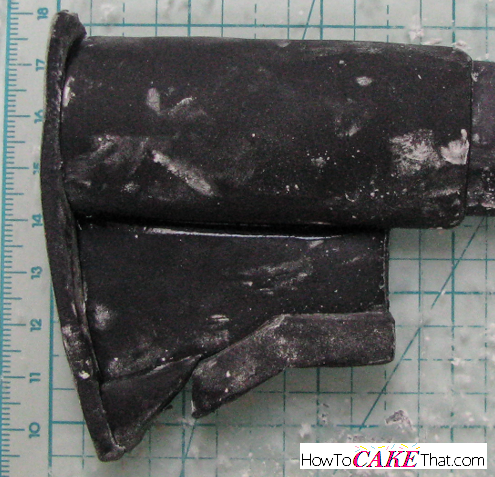 Using a thin metal sculpting tool, I created the marks on the end of the flash hider. Allow to dry. Now it's time to add the main body of the rifle. 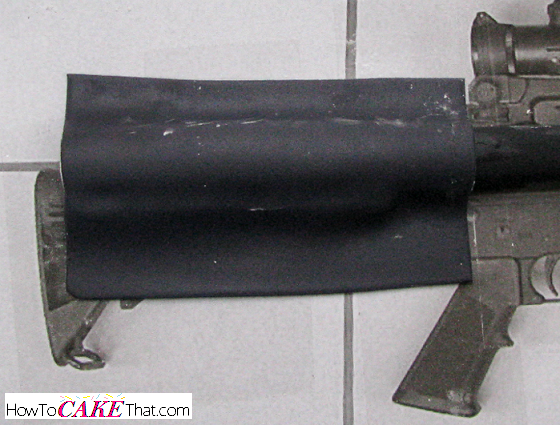 To do this, I brushed the barrel with a little water and placed a large piece of black fondant over it. Using a fondant smoother I pressed the fondant down to shape it and make it flat. 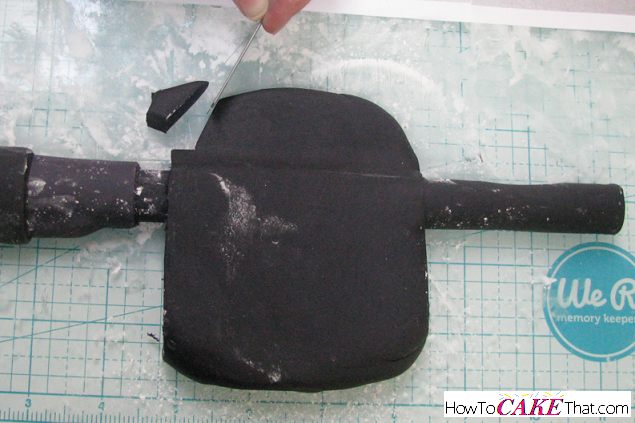 Ensure there is enough fondant to fill out the area needed for the body of the rifle. Using a razor blade, begin trimming away and shaping the body of the rifle. I did it freehanded, but if you need a guide, feel free to cut out the body of the gun from your paper template and trace around it using an Xacto knife. I used my fondant smoother to press down more on the bottom half to make it thinner and give it more shape. I trimmed around the rifle's body, but left the round place for the trigger for later - that piece to the left will be very thin and fragile when it is cut, and to prevent it from breaking off I waited until I had completed more sculpting to remove it. Here I started building up on the details on the body. I also added a very thin piece of black fondant to the bottom left half of the body and trimmed away where the pistol grip will be and also where the trigger will be. To make some of the round details, I used a standard drinking straw. And for the very small round details I used a small round piping tip. For any of the indentations that you see, I used a metal ball tool - I have the Sculpey clay ball tool set with 3 different sizes. From the area near the middle of the body that is kind of shaped like an "M", I used a ball tool to shape it, and then had to cut away excess fondant. 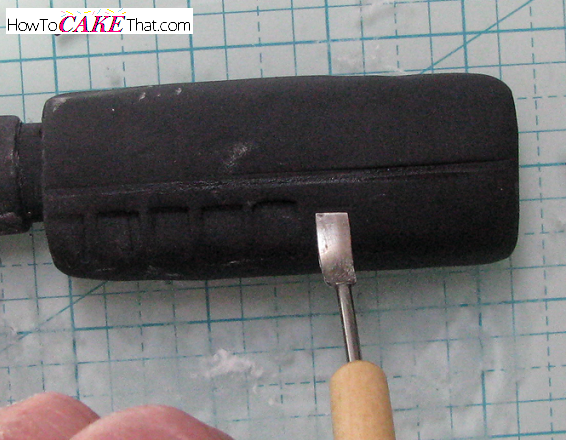 I then put a little water on it to smooth out the roughness and used a rubber tip shaping tool to smooth it out. I also used a clay gun extruder to shape all of the various size noodle-shaped pieces. Now I trimmed away the trigger area, and also added the carry handle and various other details. I shaped the carry handle over the template to help with the size and shape. I then brushed the ends with water and attached it to the top of the rifle. By the way, I know my work area looks so messy in the photos, but it is very important to ensure your work area is dusted with cornstarch at all times!! This will help keep any part of your sculpture from sticking to your work space. Now it's time to add the heat shield handguard. 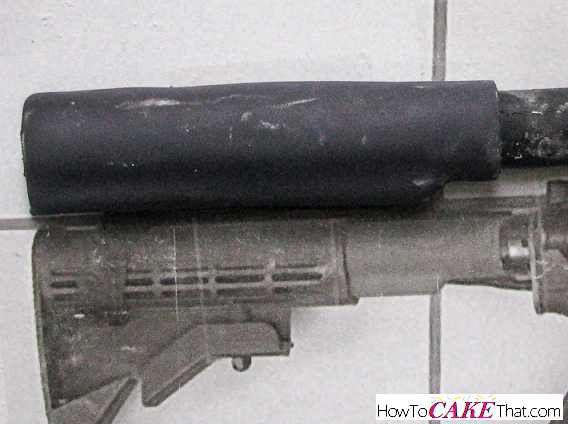 Brush the end of the barrel with a little water and add a piece of fondant large enough for the handguard and shape over the barrel. Using a square-ended shaping tool, press into the handguard to create the design as accurately as possible. Next, it's time to add the handle. 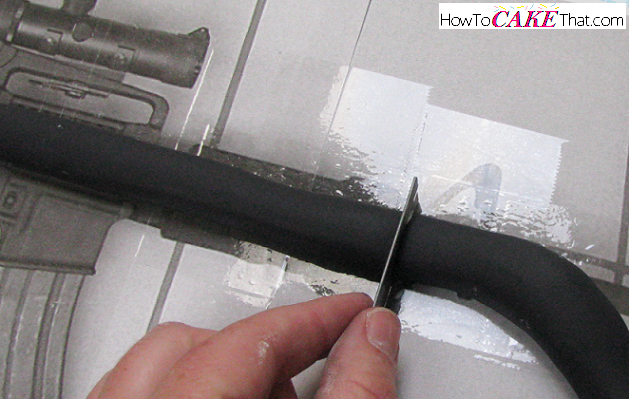 Brush the area where the handle will be attached to the body of the rifle with a little water. 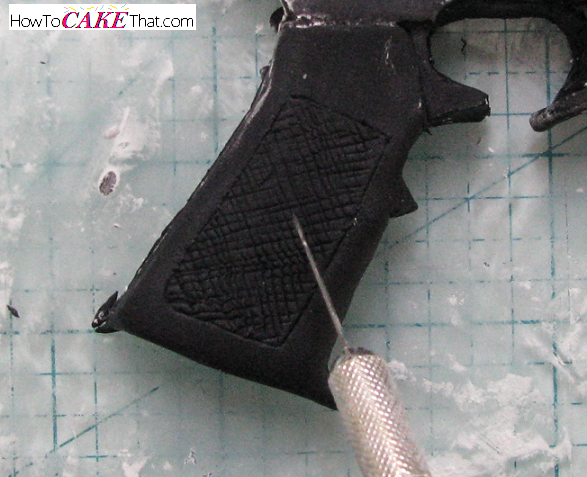 Shape a piece of fondant directly onto the body of the rifle and sculpt to form a realistic pistol grip. Use an Xacto knife to create the texture. 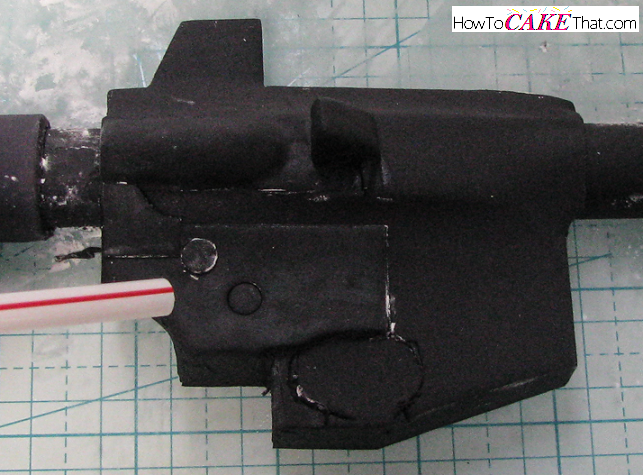 For the back end of the rifle, attach shapes by brushing a little water onto it. It's okay if the edges of your pieces don't look that sharp. After they have dried, you can go back over them with a razor blade and trim them up. Allow sculpture to dry at least 48 hours. After the sculpture has dried for 48 hours, it's time to cut out the holes. 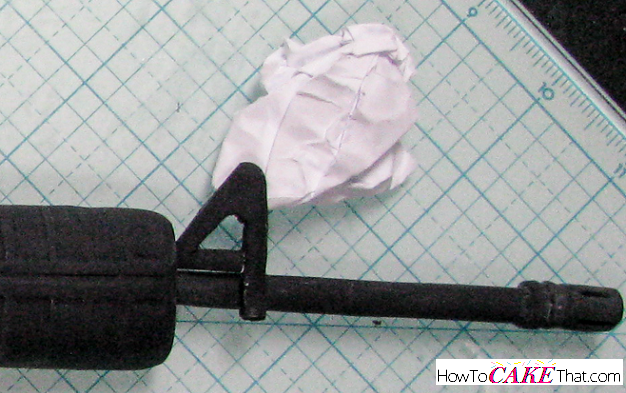 Cut out the end piece from your template and place it over the back end of your rifle. Use a small pin to mark where each hole begins and ends and also the tops and bottoms. I only do this for the first two rows. Be sure to mark inside of the hole and not right on the line, the space between the holes is very small. If you cut too much away you can't add more, it's best to start small and sculpt away more if needed. Eye it up and mark the rest based on your previous markings. 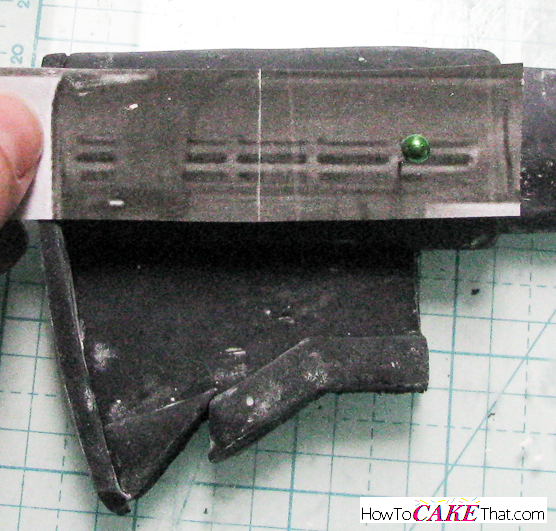 Using an Xacto knife with a new sharp blade, carefully cut away and remove fondant pieces. 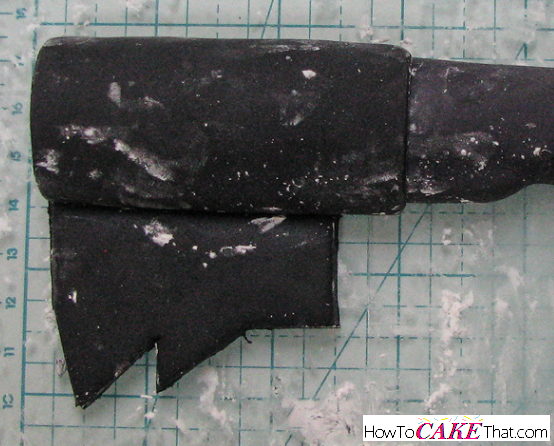 Using black fondant, sculpt and shape a magazine. Insert two small wires to help keep it attached to the rifle. 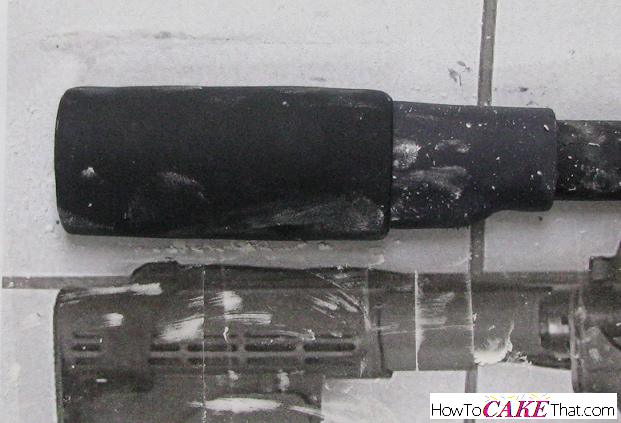 Once the flash hider has dried completely, cut small holes in the end of the flash hider. 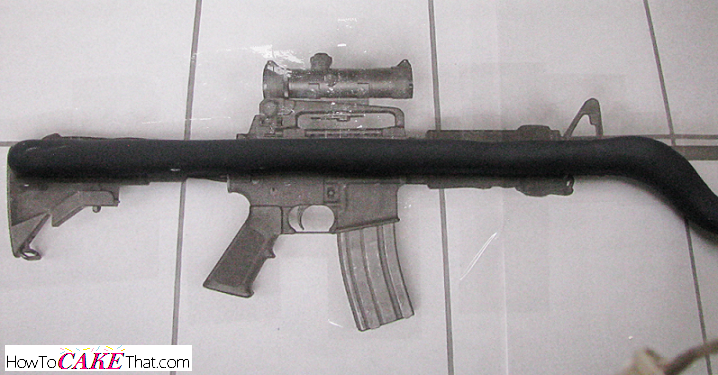 Insert the profile barrel into the handguard. Attach the sight by pressing the attached wire piece into the hanguard and brush the profile barrel (where the sight will be touching it) with a little water to help secure it. Support the sight will a ball of paper, if needed. Using a large soft brush, dust away any cornstarch. 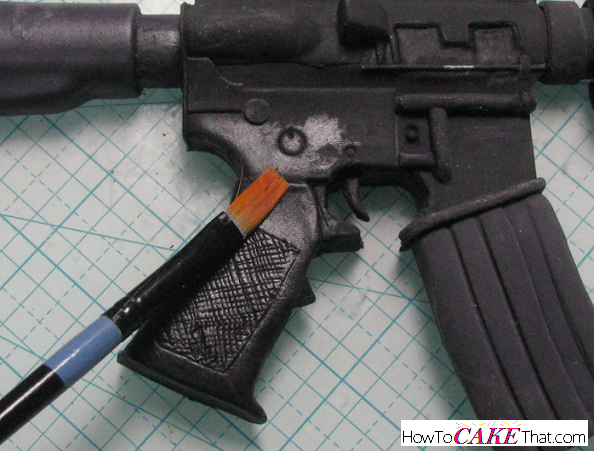 Next, using a smaller brush, brush on a thin coating of shortening to give the rifle a rich color and shiny appearance. Brush the magazine with a little dry silver luster dust, and your rifle will be complete!! I hope you have found this tutorial helpful! God bless! !